One of the main reasons people go to the movies is to watch something on a giant screen with loud volume that they can't get at their house, or couldn't get at their house until now. The Epson MovieMate 50 Projector will easily make the way you watch movies at home seem like you are actually at the theater. The MovieMate 50 isn't only the ultimate movie projector but is the ultimate movie projector, DVD, and music player. The setup is incredibly simple. All you need to do to have incredible sound, action, drama, and thrill like that of the big screen is to plug the MovieMate 50 into an electrical outlet. Thats right, just plug in and enjoy! There are no extra cables or equipment to add a frustrating setup, just plug it in. The MovieMate 50 projects movies up to 8 times larger than a 40" widescreen t.v.! The MovieMate 50's 3 chip 3 LCD technology allows for bright colors and vibrant images for a truly cinematic experience. However, movies aren't the only thing you can do with your Epson MovieMate 50, you can also play music with the MovieMate's progrssive scan DVD/CD palyer and the dual Dolby 5.1 Digital DTS 8 W stereo speakers and it is even compatible with your Apple iPod. Of course there is more than just cd's and dvd's. With the MovieMate you can also hook up your videogame system. The MovieMate is compatible with your Nintendo Wii, your Playstation 3 and your X-Box 360 for the ultimate gaming experience. The projector displays an 80 inch widescreen image from only 7.8 feet away and a 120 inch widescreen image from only 11.8 feet away which has a great 480 P resolution. If you are the type of person who likes their movies, games, or music on big screens with great visuals and and amazing sound then the Epson MovieMate 50 home projector is the perfect appliance for any home theater system. 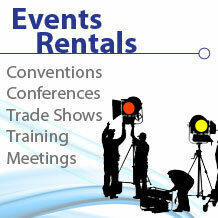 Check out our huge selection of Projector Rentals for any of your short term technology rental needs.